Get a Rainbow Tiga Cladding price below. You can price Rainbow Cladding below, just choose the profile and colour you would like and tell us how much you need. If you would like a different profile to the ones on offer just let us know and we’ll get a price back to you. A 19mm thick, V-jointed tongue and groove cladding board with a face cover width of 135mm. The overall board, including the tongue is 145mm wide. This profile can be used horizontally or vertically. A 19mm thick, V-jointed tongue and groove cladding board with a face cover width of 88mm. The overall board, including the tongue is 95mm wide. 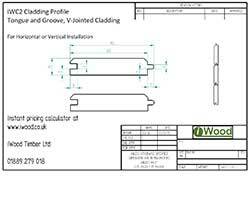 This profile can be used horizontally or vertically. A 19mm thick shiplap profile with a 135mm face cover width and 145mm overall board width. It has a tight curve on the top visible edge and designed to be overlapped. This profile is designed for horizontal fixing only. The rainshield profile is a slanted rectangle shape (nearly a parallelogram, technically an obtuse trapezoid with chamfers!). It's designed to be installed horizontally with a slight gap between the boards, giving an extremely modern, uniformed look. People often cut to exact lengths too to give a purposefully regimented, grid-like pattern. 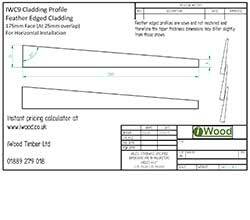 This classic Feather Edge profile is 200mm wide, and designed to be overlapped 25mm giving 175mm face cover per board. The top edge is roughly 9mm thick tapering out to 25mm at the bottom. Measurements will vary slightly as it's rough-sawn. 3) How much Rainbow Tiga Cladding do you need? How to measure for cladding? 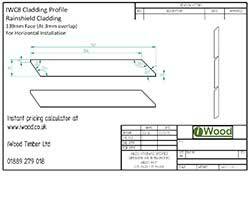 To get a price, you can type in how many square metres of cladding you need. It's very easy to work out. We're going to work out the total area of one side of a building, then subtract the windows and doors, then add 10% extra for wastage. 1) For each wall that you’re cladding, measure the full width and the height in metres to work out the total area. In this (expertly designed) example, the frontage is 9 metres wide and 4.7 metres high. 9 x 4.7 gives a total 42.3 square metres. 3) Subtract the area of the doors and windows from the total area of the wall. We now have our total area (42.3 square metres) and the total area of the doors and the windows (9.44 square metres). Because we don't want cladding to cover the windows and door, we take the door and window area away from the total area. We recommend ordering at LEAST 10% more cladding than you've measured for to account for the required cutting and shaping. 32.86 square metres + 10% = 36.146 square metres. In this case, we'd round it up to 37 square metres. Do the same for any other sides of the building, add them together and you'll have your grand total. All of our products are cut to order, not kept in stock. Because of machining setup costs, we have a minimum cladding amount of linear metres. Please add another metres ( m2) to proceed. Your total price is accurately calculated from a cubic metre rate based on the actual total volume of timber in your cladding, rather than from a stored square metre or running metre rate. The effect of the wood is created by first slightly charring it to the effect of our Tiga Wood Cladding and then applying the appropriate stain to get the colour you would like. The timber is then treated with a UV protection oil in order to preserve the colour. You will need to maintain and continually treat your timber on a yearly basis so that the colour is maintained otherwise it will fade when in contact with UV light if fitted outdoors. The timber used for our Rainbow Tiga Cladding is predominantly British Larch however other timbers are available upon request if required. British Larch is a durable softwood which is good for outdoor use and can be easily machined or sawn into any of the available profiles. Your cladding will be charred and stained on one side and two edges so the none finished ends and sides should be hidden when fitting. We can also supply accessories to match the colour of your cladding for the best effect. Due to the amount of work that goes into our charred and coloured cladding products we are working on 4-6 week lead time as they are all machined, charred and stained to order. We supply this cladding in random lengths 1.8m and longer. If you require fixed lengths please contact us and we’ll check the availability on the lengths you require. Our Rainbow Tiga Wood Cladding is designed to be installed by a professional with previous experience in successfully fitting cladding who understands how timber can expand and contract. The information here is provided as an overview only and is not a substitute for professional fitting advice. Consult a fitter to determine if your scenario would require the fitting of a breathable membrane between your wall and the cladding. This membrane stops rain getting to the wall, but allows moisture to escape, helping to prevent internal condensation and mould that can come with it. If you choose our Rainshield profile, ie. IWC8, you will most probably need a membrane as a gap is purposely left around the cladding. Treated softwood battens (available from our cladding accessories pages) are most commonly used to fix to the wall (or on top of the breathable membrane) to then fix your cladding to. 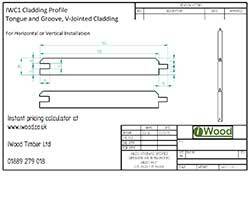 If you are fixing your cladding horizontally, your battens need to be placed vertically, at around every 600mm (60cm), and vice versa. The method of fixing depends on the profile you choose. You can fix with nails or screws, but whichever method you choose, make sure you use stainless steel or another type which will not be corroded by the natural acids in the timber. Never use iron fixings with timber. If using screws, we recommend pre-drilling the timber and holding the cladding on with the head of the screw. If nailing (again, don't use iron), use a nail with quite a large head so the cladding doesn't pull through. If you opt for a Feather Edge profile, ie. IWC9 or IWC10, start at the bottom of the building and use some extra batten to hold the bottom of the bottom board out from the building. Feather Edge cladding is for horizontal fixing only. If you choose a tongue and groove profile, make sure the tongue is at the top, otherwise moisture will sit in the groove. We sometimes alter the profiles that are available in Tiga Wood finish. Profiles IWC1 to IWC4 can be fit horizontally or vertically, IWC5 can only be fit vertically so water doesn't sit in the channel. Rainshield cladding should only be fitted horizontally with a gap of around 3mm. As already stated, these are just ideas to get you thinking about installation and you should consult a professional installer before fitting your cladding as every scenario is different. As standard, your Rainbow Tiga Wood cladding comes pre-treated with a Danish oil. If left without annual re-treatment with UV protection oil, weathering will very slowly take the wood back to its natural appearance. To maintain the seared finish, an application of UV protection oil is recommended every year, such as the OSMO 420 UV protector. I'm very happy with the customer service here and will be definitely using iWood again in the future. Very detailed website for ordering my exact requirements easily. I have ordered from you before with no problems. You were recommended to my business, and you pricing was very competitive. The order process is excellent, this is my second order with you. Our timber is imported straight from sawmills on the continent. Our usual lead times are therefore 4-6 weeks.